By bus: You take the bus in Rio de Janeiro at ste bus station , the name is NOVO RIO, the compagnie of the bus is "1001" you buy the ticket for Buzios directly. You've 3 hours of travel. At the final station of bus, the DEAUVILLE POUSADA is AT 5mm. From the station of bus, take straight the principal street until A the service station ALE. After that Cie take the 3 street on the right, the street of the panorama. while going up 100 meters it has is the very white house on the left. You can take minibus or taxi. By car: In Rio de Janeiro, take the freeway North BR 101, take the bridge of NITEROI attention there are a toll, after go on off direction REGIOS DOS LAGOS, it's at 180KM. To the toll go on on the freeway pass cabo frio and take out panel buzios on the right. 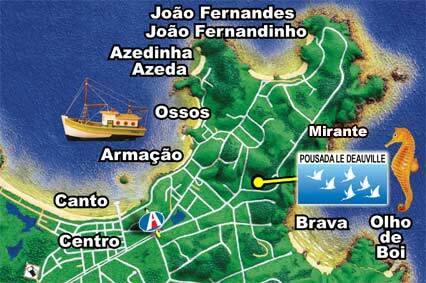 To continue 10 km straight, you arrive have the door of Buzios.Allways the time straight until A the service station ALE. After that Cie take the third street on the right, the street of the panorama. while going up 100 meters it has is the very white house on the left.